An arch commemorates the Moonta soldiers who served in World War One. The arch was a bequest by Private Percy Beaglehole, who was killed in action in France on the 16th of August 1918. 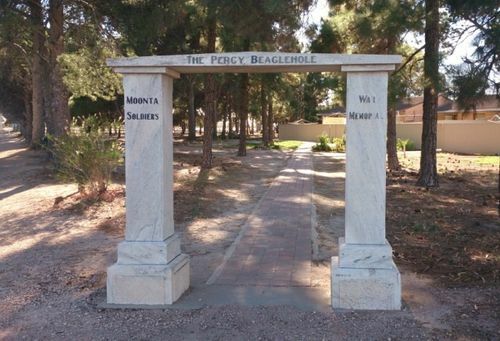 The late private Percy Beaglehole's memorial to Moonta soldiers—a marble arch—was unveiled by Mr. Archer Whitford of Sydney, an old Moonta boy. The Mayor (Mr. R. J. Hughes) presided. Mr.Whitford delivered an address which was followed by an address by Mr. Findlay, president of the Moonta Sub-branch of the RSL. A two-minutes' silence was observed by those present as a tribute to the honored dead. Pastor J. E.Allan, of Cheltenham, Victoria, who left here 18 years ago, after a successful ministry at the Moonta Church of Christ, spoke on behalf of the Beaglehole family. 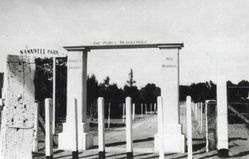 The memorial occupies a prominent position at the town entrance of Nankivell Park. It was erected as the result of a bequest by Private Percy Beaglehole, son of Mr. John Beaglehole, of Moonta, who enlisted in October 1915. Private Beaglehole was killed at Moquet Farm, in France, while serving with the 50th Battalion in August, 1918.